Because it is generally out of sight, you may not consider your building’s foundation on a daily basis, but your commercial facility’s foundation is the literal bedrock of your business. Unseen forces, such as exterior water, or shifting soil can cause major stresses to even the sturdiest foundation. Regular foundation inspections are good business, helping you avoid having to close your doors to customers and lose valuable revenue should your foundation need a major repair. However, if you ever should find yourself with any of the tell-tale signs of foundation issues, Dirt Connections is here to help. Our team of experts has years of experience diagnosing and repairing everything from minor cracks in a foundation, to a complete structure overhaul. Knowing the signs your foundation may be in need of repair is a great way to keep a small problem from becoming a big one that may cause you to have to temporarily shut your doors. Below are just a few signs that your commercial facility’s foundation may be in trouble. If visible cracks appear in your building’s walls, ceilings, or floors, it may be a warning sign that your foundation is settling and shifting. This may compromise the structure’s safety and eventually could lead to a host of more serious problems. 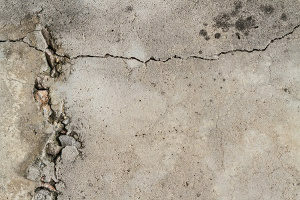 Cracks in walls, ceilings, and floors are the number one sign of foundation issues and can take on many different forms, all of which can point to a need for commercial foundation repairs. Inconsistencies in the level of your flooring, such as sagging, bowing, or humps, may indicate that the structures that support your business have shifted due to soil movement under your foundation. Uneven floors may also be caused by water-damage or failing supports, all of which are serious issues that would jeopardize your foundation’s integrity. If your facility has uneven, sagging, or bowing floors, contact Dirt Connections immediately. Basement walls that have shifted, or curved inward are often a clear sign that exterior water flows are negatively affecting your facility’s foundation. When the soil around your foundation becomes saturated with water it may expand and push your walls inward. Once dry, the soil contracts, creating weak spots. A qualified foundation expert can help determine the best method for resolving this issue, and should be contacted immediately. If the ground immediately around the base of your building is sinking or easy to compress, it may indicate water is threatening your foundation, or that your foundation has already shifted away from its original position. Windows and doors that won’t stay closed, are difficult to open, or that have significant gaps are clear signs that youn has shifted and may be sinking. The soil beneath your foundation may not have been adequately prepared for the weight of your facility during construction, or a significant amount of water has weakened the area. If your business has multiple doors or windows with these symptoms, it is best to contact a professional to determine whether or not your foundation is to blame. 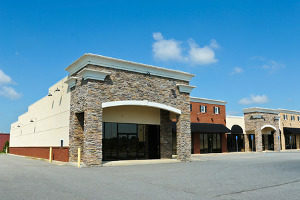 Dirt Connections knows that protecting your business and your investment in your facility is important to you. The need for a commercial foundation repair presents a unique set of challenges to business owners: How can we minimize the effect this project will have on our customers, and our bottom line, while still taking the time and care necessary to keep our building standing for years to come? Dirt Connections recognizes these challenges and is here to help. Contact us today to discuss the status of your foundation and find out how we can keep your building rock solid!